From Russia With Love does not refer to the James Bond movie. 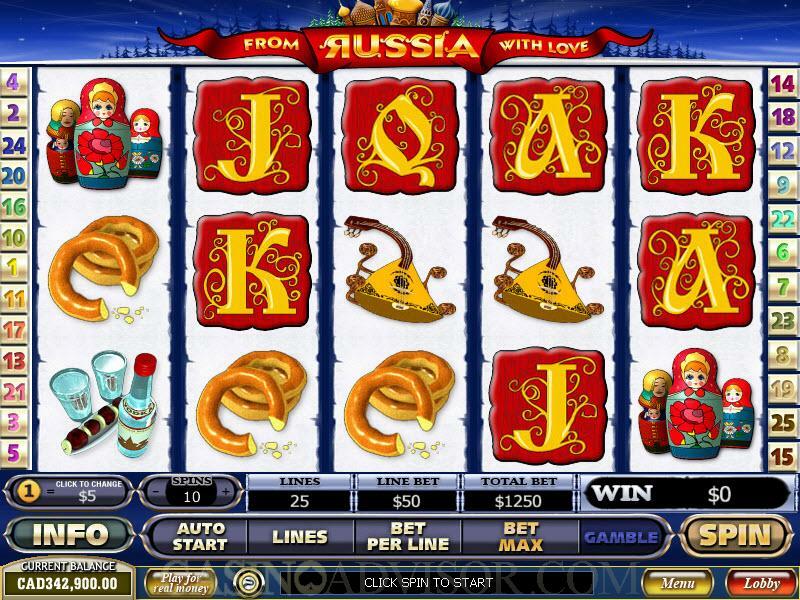 However the slot game does bring the culture of Russia to the reels. The slot begins with a caricature of the Kremlin, Russia’s most identifiable building. The symbols on the reels are all easily identifiable with Russia. The wild symbol is the Onion. It has reference to the typical onion shaped domes found on Russian buildings. The scatter symbol is Vodka, Russia’s national drink. The bonus symbol is the Dolls, the colorful wooden types that open in the middle and hold a smaller doll inside. The other thematic symbols are Samovar, Russian Lute, Russian Shoes and Russian Donuts. The high value cards from Ace to Ten are crafted in ornate embroidery as a relic from the Tsarist era. 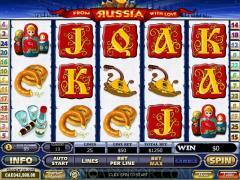 From Russia With Love is a 25 payline slot game with players wagering up to 10 coin per payline. Players wanting to wager the maximum in these two betting options can click the Bet Max button. The players can independently choose the coin denomination. The options available are 0.01, 0.05, 0.10, 0.25, 0.50, 1.00, 2.00 and 5.00. Hence the maximum line bet works out to 50.00 credits and the maximum total bet per spin to 1250.00. This slot is suitable for both low rollers and high rollers. The Vodka symbol offers scatter payouts when three or more of these symbols appear anywhere on the reels. The scatter payouts are multiplied by total bet in order to convert to credits. Five scatter symbols payout 250 coins, which amounts to 312,500.00 credits at maximum total bet. The wild Onion symbol also offers the highest jackpot of 10,000 coins, which amounts to 500,000.00 credits. The bonus round is called Matryoshka Bonus. It is triggered when the Dolls symbol appears simultaneously on Reels 1 and 5. The player has to play a bonus game on the second screen in order to fix the free spins parameters. The bonus game does not offer any payouts. The Matryoshka Bonus has five levels. In each level the player has to select one of the dolls on the screen. Most of the dolls reveal the number of free spins and take the player to the next level. However if the player picks the wrong doll then his progress stops and he has to be satisfied with the total number of free spins collected so far. If the player goes through all five levels his payouts in the free spins are doubled. The maximum number of free spins that can be earned is 74. There is a gamble game on offer in which the player can try and double his staked amount. This amount can be half his current win or the entire amount of his current win. The player wins if his chosen card is higher than the dealt card. Interested in reading more detailed information about From Russia with Love? If so Click Here for more details.